I could have sworn I’d mentioned this here, but in all the excitement of Christmas and the release of Sitala in UnCommon Minds, I must have missed it. The Future Chronicles is a fantastic series of anthologies created by Samuel Peralta. Starting with The Robot Chronicles, each anthology has a specific theme from AI to Aliens to Telepaths. These books really are the cream of the anthology crop and every one of them has been a bestseller at some point or another. The list of authors that have appeared in the series is a who’s who of speculative fiction and includes people like Ken Liu, Seanan MGuire, Hugh Howey, Annie Bellet, Susan Kaye Quinn, and Robert J. Sawyer (among many more). 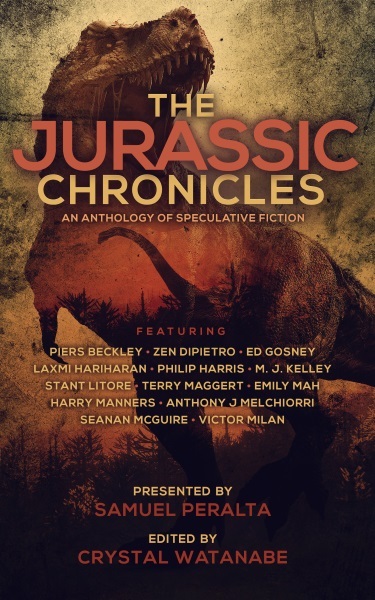 All of which is to say that I am incredibly pleased to say that I’m appearing in the latest Chronicles title – The Jurassic Chronicles. My story is a return to the characters from my science fiction novel, Glitch Mitchell and the Unseen Planet. It’s called Glitch Mitchell and the Island of Terror, and I’m pretty sure I don’t need to explain the plot. Suffice to say, the idea of throwing my pulp adventure heroes into a world filled with blood thirsty dinosaurs was irresistible. The Jurassic Chronicles launches on 29th January and you can join some of the authors for a Facebook launch party (and maybe win some prizes) from 6:30 – 11:30 EST. Sign up for my newsletter and get four free ebooks. CLICK HERE to get started.